I'm hoooked on Asia. 20 Years in Japan and counting. These last few years I've traveled in Thailand, Singapore, Vietnam, India and the Philippines. Love them all, and hungry to see more. Japan is always said to be a land of contradiction. Foreigners also often say that they feel that Japanese society is a bit cold. Well, I found an example of both while going through the checkout at the local supermarket... No Regi Bukuro!! 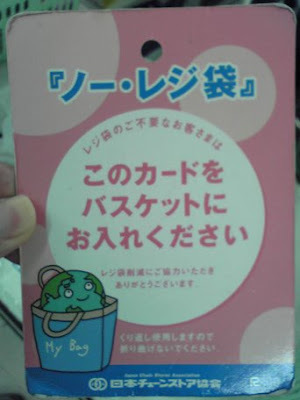 The blue lettering at the top says "No Regi Bukuro"...ie, No plastic bags! Then in white, it says, "For customers who do not need plastic bags, please put this card in your cart." It's to promote the "My bag" notion of people bringing their own cloth shopping bags to reduce plastic use. I applaud this effort from a country that loves packaging. As an example, if you buy a package of cookies, each one will be individually wrapped in plastic. Several will be put into a larger plastic package, and several of these are put on a hard plastic tray. These are then packaged with the brand package. And all of this typically ends up in a plastic shopping bag. So by at least eliminating the shopping bags, they are 1/6th closer to reducing plastic waste. Kudos! First, I think it's a nice example of contradiction in Japan. Not because of what they are doing, but because of how they are doing it. I mean, why create a dozen of these cards for each cash register -- using paper and plastic and paint -- for every cash register in every major supermarket in Japan? If people don't need bags, all they have to do is say, "No bags, please." Instead, they are reducing plastic in order to make more room in the incinerators for these cards. "Let's reduce garbage by making more." Ok, the cards are not used on the same scale, I admit. But the contradiction still exists, as does the foolishness of whoever created cards when all people have to do is say "No." Which brings me to a small insight into Japanese communication. The cards are not at the front of the queue -- they are right at the register. In fact, you almost have to ask the check out girl to move your basket in order to take one and put it in your basket as she's already removing items and checking them. It's nice to know that Japanese people are equally cold to their own, and not just to the foreign community. I've been going to to the same sports club every week for the last 2 years, and still they greet me as if it's the first time they've ever seen my face. But they do that to the Japanese customers, too. Interestingly, when teaching this kind of "transactional" language in English, corpus studies show that just as important as the language needed to shop is the language needed to small talk, as friendly interactions are a part of daily community life, even between strangers. I've found this to be true pretty much everywhere I've ever travelled. This shopping card device is almost an institutional encouragement NOT to be friendly, and NOT to interact verbally. Never a dull moment in Japan, kids! For the record, I would say that Japanese society is cold, not the people. As an example, a student of mine got a job at a family restaurant near the university, "Big Boy." I was in there for a few hours working on my computer late at night and watched the manager teach her how to serve customers. She had to repeat a highly formalized and ritualized set of utterances -- no room for smiles or anything but business. And she must have done it about 200 times. At school, she was a fun and friendly person. Lots of smiles. But to customers, she's a drone. As with a lot of service personnel, she's been more or less brainwashed that there's no place for civility in a business transaction. My career is in education. Part of my life is teaching in Japan. The other part of my life is writing textbooks.